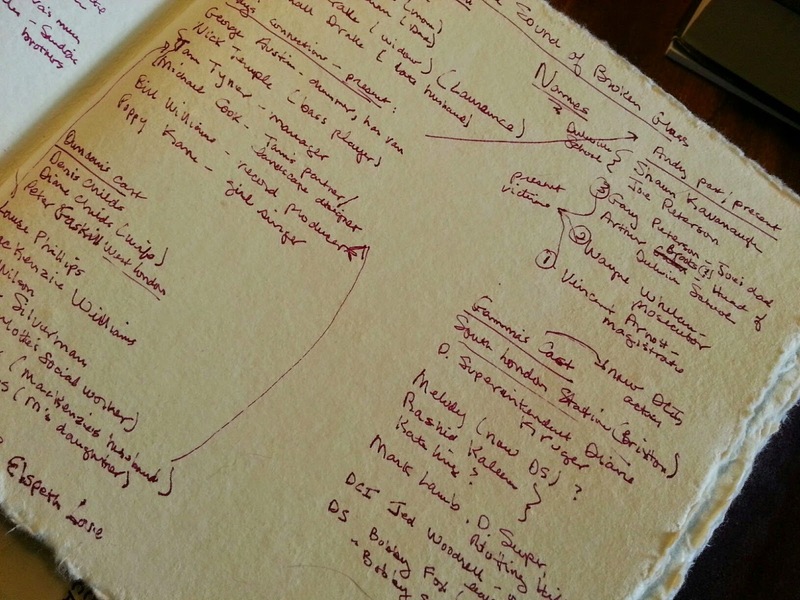 DEBORAH CROMBIE: Confession: Book tours wreak havoc on a writing schedule. 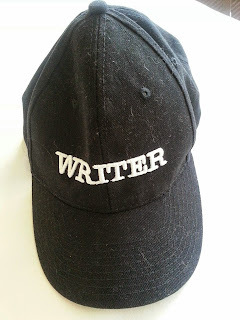 But now that I've had a few days to catch up, I've put on my writing hat and I'm digging in. (This really is my hat, dog hair and all. My niece bought it for me at Universal Studios! I feel just like Castle!) However, I'm still not quite set on the title of Kincaid/James #17, and I'm struggling with character names. Sometimes names are easy--I just instantly know what a character should be called, and it sticks. And sometimes I try combination after combination after combination trying to find the right one. Very frustrating, as I have trouble writing a character until I know his or her name. some of these names didn't make the cut. I've never been comfortable using the names of close friends and family. That takes out a good few, and so is a tradition I won't swear to keep up. Then there's the fact that Britain, and London in particular, are very multi-cultural and multi-racial, so some of the characters' names need to reflect that. And THEN there's the rule about not having characters whose names start with the same letter, or characters whose name have the same sound. For instance, you don't want all your female characters to have names that in "y" or "ie." I've obviously broken the "same letter" rule--I have Duncan, Denis, and Doug as continuing characters, for starters. Oops. Oh, and you don't want to give a character a name that is inappropriate to their age. You wouldn't want to name a woman born in the fifties "Tiffany" or "Brittney"-- it just doesn't feel right. 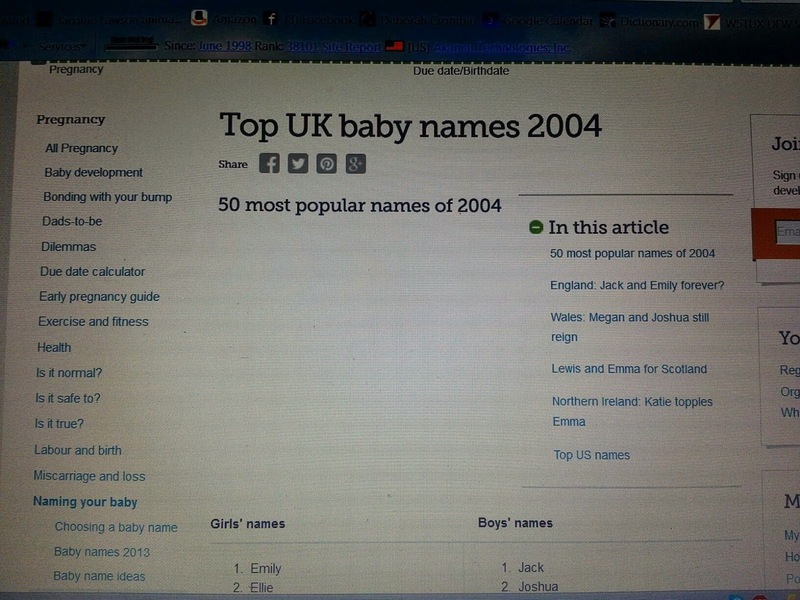 Baby naming web sites are a great resource for this challenge. 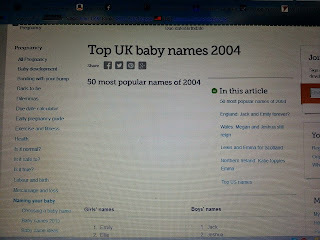 Here's one I pulled up, as I'm trying to decide on names for two ten-year-old boys. many of these actual make it into the finished book. So, fellow REDS, how do you go about naming your characters? Do you have system? Do you change names in the course of a book if they don't seem to be working? And readers, how much attention do you pay to names? Your book tour schedule sounds quite daunting. Names in books . . . I think I notice them if it is a strange name or if it seems very out of character. Otherwise, I'm good with whatever the writer has chosen. So interesting Debs--I can't imagine keeping track of things after 17 books in a series! You need a personal assistant with all the facts at her fingertips:). I do use names of real people--though not for the bad guys. And I try to make them sound like Key West. I did make one error and changed the name of the Key Zest secretary between books one and two. No one noticed--not even the copyeditor! Have a great time in California Reds--sorry not to be joining in the fun!! Debs, you need a spreadsheet! 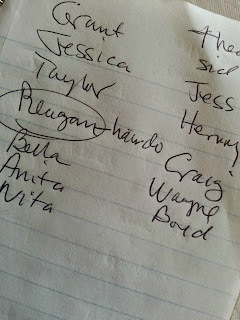 Since I no longer write a series, and my books tend to have relatively small casts of characters, it's not as hard to keep track. Still, the character of a... character can change in the writing and a name that worked when I was on Page One can feel wrong by mid-book. All I can say is thank heaven for Search and Replace... I learned the hard way never to name a character a short, 1-syllable name that lurks in the middle of everyday words. I use real people's names all the time, and the character is never anything like the real person. I struggle with last names, trying to reflect the ethnic diversity of a place. I finally grabbed a fistful of old school directories and thumbed through them. For my 16th century mysteries (spin off from the Face Down series coming in March with Murder in the Queen's Wardrobe) I have a long list of names compiled from genealogies of families of the era. They did tend to reuse the same few names, especially Mary, Jane, Catherine, and Elizabeth for women, but there are also some wonderful exceptions to the rule. My absolute favorite is Dowsabella Tempest. Names are my downfall. I always think I've got it, and a critique partner will say, "Um,nope." I live in Pittsburgh and am from Buffalo, so I love mining the ethnic backgrounds (Polish, German, Irish). But I'd have to say, as a reader, the name rarely sticks out at me unless it's very unusual. I doubt I'd notice repeated names or starting/ending sounds. I tend to notice names. There's a series--not by the Reds--where a male character has a name that just grates on my nerves every time I read one of the books. You'll notice that I keep reading them, but it bugs me every time because I feel the name is such a mismatch for what the author wants that character to be. And I just can't warm up to him. That said, it once took me 10 years to find a name for a character--and when the name came, the manuscript was finished shortly thereafter. I don't have a problem with any of the Reds' characters and their names--the names really suit them--and they come to feel like old friends, or people whom you would like to meet--like Duncan and Gemma. Oh, and just so you know, I love the name Gemma. It came to me in a dream for a character in a story I hope to finish some day--a fantasy--not a mystery. Names in books .... One thing that drives me crazy in Michael Connelly's books is that everyone talking to Harry, says his name. Over and over sometimes in the same conversation. There should be a drinking game based on it. :) We don't do that in real conversations to the person that we are talking to so it really stands out to me. Oh, please. It is SO DIFFICULT! I my new book, I almost wound p with LAnna nd Zanna. And I am STILL having trouble with a main character, who will always be Meredith to me, but I already have an unchangeable Melissa. ANy ideas? It has to be a smart, powerful woman, three syllables, cannot begin with a J M T B or D--and can't end in A. And it's can't have a lot of e's like Colleen or Eileen. All of the men in my stories start out as David or Tim. I have no idea why. I like names that reflect something about characters. So many names comes with baggage. I'd expect a female character named Scarlett to be strong-willed, or just the opposite, for irony. Ramona, too funny. I'm always very tempted by Tim, and have to remind myself that I already have a Tim as a continuing character. It's all kind of silly, really, because in real life we all know lots of people with the same names! So what not have two "Johns" or "Tims?" Maybe we underestimate our readers! Hank, thinking... How about Annabelle? I tend to like quirky names, but only if they fit the character. Like Ramona said, I like for the name to be expressive of the personality. Having said that, I'm also fine with ordinary names, and, of course, that what the majority of characters will be. The quirky are for those special characters that play that role in the story. The names that the Reds have given to your main characters seem so right, and now I know what work went into arriving at those names. Yet another reason to admire the work you all do and the amazing results we get to read. Of course, Lucy, now I have to go back and look up that name change. Deborah, you've got a point. I worked in a company that had five "Matt's" - four in the same department. What a possibility for a mix up, right? I recently had to come up with an "older" female name that had a more up-to-date nickname, but it couldn't end in the "ee" sound. It was harder than I though. Abigail, Catharine, Corrigan, Gwendolyn, Lillian, Sheridan, Valarie, Vivian . . . .
Repetition, a la James Michener, who had so many generations with the same name it was impossible to keep track of which era I was reading about. Same with Garcia Marquez's 100 YEARS OF SOLITUDE. Intentional hints to character. I once read a book (written by a friend) where the main character had a notoriously roving eye, and his last name was Titsman. Good grief. Talk about telling, not showing! Impossible to pronounce names, or names that are unusual enough that you're not sure how they are pronounced. I love Sue Grafton's mysteries, but have never been able to decide if it's "Malone" or "Mill-HONE". It doesn't really matter, except that it drags me out of the story every single time. Debs, I can't believe your grueling schedule! You and Hank, both. But I am glad we got a chance to meet, and I'm sure a jillion other fans feel the same way. This is reminding me of a manuscript I once read where the main character and her worst enemy were both named Sandra (I think). SO CONFUSING! I asked her why she did that. Because, she said, in real life the people she was writing about had the same name. WRONG ANSWER! I don't know about matching name to character; I know plenty of people whose name seems very unlike anything I'd ever have chosen for them. There were once five Joans working in my building, three of them in our small hallway, and two of whom were in the same department, and all with totally different personalities from each other. All but one have retired, making life much easier when someone says "you had a call from Joan." Writers, as she said, do not use the same letter for the beginning of your characters names, Caroline, Chrissy, Charlie, Caron. Hard to follow, and a good reason to put the book down, and choose another. Deb, I'm in two bookclubs. One of them has no fewer than five members named Jeanne, all spelled the same, and all pronounced "Jeannie". It's beyond bizarre, and if you put it in a book no one would ever believe it. As a reader, I don't particularly notice them. Until I do. As a writer, in my latest book I was about ready to submit before I realised the protagonist had no name (that can happen with first person narrative). I didn't have a clue, but she had to have one, since she was not Mrs. dW2) I finally came up with Charity, but she could just as easily been Chastity. Names - what a great topic. Nothing much to add, except that I'm in an exercise class on Wednesday morning with... wait for it ... another Edith! And she's younger than I am. Unheard of. So we delight in saying, "Hi, Edith." "Hi, Edith." Since we otherwise never get to, because all other Ediths are already dead since they were my great-aunt's age. Hank: what Joan said. I like Abigail. It rocks. names like that tend to annoy me, the books I read are not comedies, so trying to play on names when it comes to characters bugs me. other than that type of situation in names, I generally enjoy character's names.......especially so if it is a series..they become friends. I felt confused so often, I'd see constable and think it was a constable, but it was the DI - book was good, just the play on names was "different"
Roger Keevil writes a series with Detective Inspector Andy Constable and Sergeant Dave Copper. "Murder Comes to Call" was the latest in the series . . . . I have been known to change character names as the character develops in the story. I will research name origin and meaning to see if it clicks especially with the main characters. I don't think about names of characters in the books that I read. But they must be well developed and distinctive. I have an ongoing character name list that I review from time to time. For minor characters I try to find names that no one in the US has (Mimsie Tricket, for example) and Google those before I use them.